ABSTRACT: Do voters in white districts systematically obstruct minority representation? Despite a great deal of public and scholarly attention, this question remains largely unresolved. We demonstrate that the narrow focus on the relationship between white voters and minority representation is inadequate to understand why we do not see more minority-elected officials in the United States. We use a matching technique to investigate three theoretical perspectives of descriptive representation using a unique dataset from the 2012 general elections for state legislative seats in 14 states, the first elections after the 2010 redistricting process. 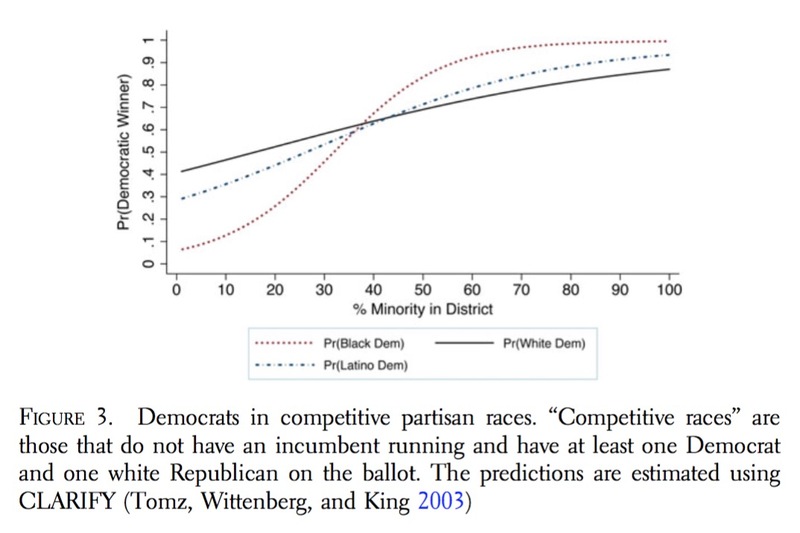 Our findings challenge the venerable notion that minority candidates consistently underperform in white districts, and complicate our understanding of the political expression of bigotry in the voting booth. CITATION: Juenke, Eric Gonzalez, and Paru Shah. 2016. 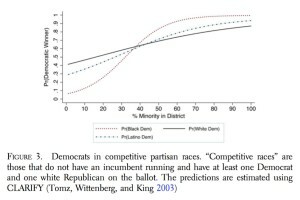 “Demand and Supply: Racial and Ethnic Minority Candidates in White Districts.” Journal of Race, Ethnicity, and Politics 1 (01): 60–90.